Listening to Sirius Satellite Radio's Soul Town station, I commend them on playing full versions of many classic hits. This week was devoted to a lot of Philly Soul, and I heard this favorite of mine in its full six minute version twice. Kenny Gamble and Leon Huff, who not only ran the Philadelphia International label, but wrote and produced many of their hits, were true geniuses. Had to say it. If you think about all the amazing productions that came out of their shop in the 70's from the O'Jays, Harold Melvin & The Blue Notes, Billy Paul, Teddy Pendergrass, and MFSB, you know you are talking about a truly unique production sound and first class songwriting. And they often could get the dance floor busy as well. Now it really takes a genius to create a six-minute classic based on two chords -- E minor and F# minor, for those keeping track. A paean to loving "any kind of music," with a thumping bass pattern that virtually never changes the entire song, and yet it works because the groove is magnetic, the O'Jays' vocals are gospel-ish electricity, and the arrangement, as usual, never fails. I probably should add this song to my list of great song openings of the 60's and 70's. A chunky conga beat played solo for several seconds, joined by the drums with a prominent hi hat, and the climbing bass part that goes back and forth between E minor and F# minor roots. As soon as you hear those congas, before anything else comes in, your head is already shaking in time and your body is ready to groove along. Gamble and Huff often used the O'Jays for their most powerful "message songs" of unity and love, a common theme of 70's soul music (see my post on War's "The World Is A Ghetto"). As a matter of fact, one of their albums was called Message In The Music. 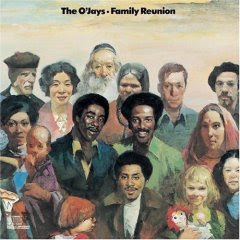 And if you see the Family Reunion album cover (above), where "I Love Music" was taken from, there is nothing subtle about not only their message, but their desire to cut across racial barriers with their success. I'm enchanted by the things that you do. All the joy that it's bringin'. Mellow, mellow wine and song. The arrangement propels this song for a full six minutes, with the drum and bass amazingly staying in lockstep for the same beat and two chords, mixing in the percussion-y transients of a hard-played piano, horns, that infamous conga, and the jazzy chorused Fender Strat guitar strums and lines. In Philly, they always played live. While the song came out in the early disco era, it didn't really have the characteristics of a disco song other than sharing a 4/4 beat. Yet, you'd have to be crazy not to put out a song called "I Love Music" that you couldn't dance to. With the O'Jays calling out to each other and clapping their hands, this is one song everybody can really join in. Three videos for this one -- 1) The O'Jays performing the three and a half minute single version of "I Love Music" single on TV's "Soul Train" in 1975, 2) another clip from a different "Soul Train" show where the dancers lined up to show their moves to this song ("the so-o-o-o-o-oul train! "), and 3) the full 10-minute 12" version (which is a must if you haven't heard it before) with guitar solos, orchestra and the O'Jays raising the floor with "I love, I love, I love, I love music!" Who sang the other version of I love music by a female. Had a disco jazz funk sound to it.